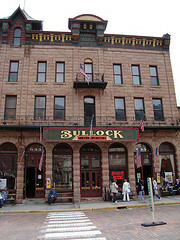 The Bullock Hotel in Deadwood, South Dakota is one of the most popular haunted hotels in the United States. As a matter of fact, this haunted place has actually drawn the attention of international ghost hunters from around the world. Seth Bullock and Sol Star arrived in Deadwood, South Dakota in an effort to enhance their hardware business. Eventually, the winds of fate would change their professional status. Bullock became the first sheriff in the town, and while he still conducted business in the hardware store with Star, it eventually was destroyed by a fire and the two collaborated to open up The Bullock Hotel in Deadwood. Here, you will learn about the ghostly tales that surround this structure. •	Many have claimed that they have seen what appeared to be a ghostly apparition of Bullock in many different areas of his hotel. •	There are stories that a strong paranormal feeling has been identified. •	Dishes of all types have been known to shake for no apparent reason and actually move, or even fly! •	Electrical disturbances have been noted in the Bullock Hotel. Lights turning off, or even on comes to no surprise in this building. •	Many, when alone, have heard their name being addressed only to discover that there is no one close enough to have called it. •	Some report being tapped and/or touched by an invisible presence. •	There is an antique clock in the hotel that is kept for the purpose of being a part of the history of the Bullock Hotel that actually chimes and goes off with no assistance. •	Many appliances, especially small ones like alarm clocks, will go off by themselves – whether or not they are plugged in! Televisions and radios seem to work on their own – with no assistance. Many times, they shut off. Get the directions, view photos, and read the reviews and traveler tips for the Bullock Hotel.